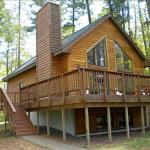 Situated in Ino in the Wisconsin region Deer Trail 13 Log Home has a garden. Guests staying at this holiday home have access to a terrace. The 5-bedroom holiday home is equipped with a living room with satellite flat-screen TV and DVD player and a fully equipped kitchen. The nearest airport is Duluth International Airport 79 km from Deer Trail 13 Log Home.